Can neodymium magnets be turned on and off? Generally, no. The neodymium magnets we provide are also called, “permanent magnets.” The word “permanent” means they stay magnetized for a long time. They are always on. This is the opposite of an electromagnet, where you have to run an electric current through a wire whenever you want it to act like a magnet. No flow of electricity, no magnet. It's also opposite of a "temporary" magnet, like when you stick a (permanent) magnet to a steel paperclip, and that steel acts like a magnet as long as the (permanent) magnet is stuck to it. Remove the magnet, and the paperclip stops acting so magnet-like. When people ask us for magnets that can be turned off, we say it’s not possible. Neodymium magnets, large and small, tend to stay ON. That's part of what makes them so useful. A simple magnet doesn’t come with an ON/OFF switch. There are products available that do provide this sort of functionality. Their construction is a little more complex than a single magnet, though. MJ-95 MagJig 95 provides up to 95 lb of pull force. MJ-150 MagJig 150 provides up to 150 lb of pull force. 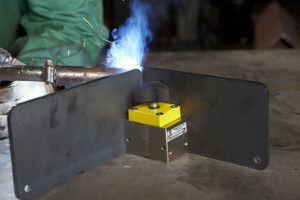 MS-400 MagSquare is a larger, more powerful magnet that provides up to 400 lb of force. These Magswitch® products all have a knob on top that can turn 180°. When in the OFF position, all of the magnetic attraction is somehow contained inside. It doesn’t stick to steel. Touch the bottom of the magnet to a steel surface that you want it to stick to, and turn the knob. Now it attracts with an incredibly strong force. We’re talking about the surprisingly strong neodymium magnet kind of force! When you want to remove it, simply turn the knob back to the OFF position. This makes it much easier to remove. Magswitch® magnets can be used in all sorts of applications. Anywhere an OFF switch might make the job easier, they make sense. The people we hear from most are those who work with wood or metals. 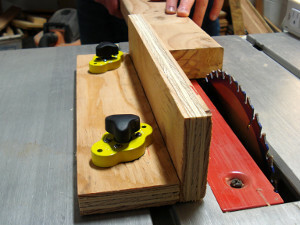 Carpenters, woodworkers and furniture makers find a lot of uses for them. The magnets can help make fixtures or jigs come together easier, faster and with more adjustability. Woodworkers find these things incredibly handy. Welders find these tools useful as well. Better positioning and setup is possible with these magnets. It’s possible to work faster than if you had to construct something with nuts and bolts and steel. Can’t I just make one myself with a few magnets from K&J? Is it physically possible to make something like this using a few neodymium magnets from K&J? Sure, it’s possible. In fact, when we started investigating how these things worked, we couldn’t resist building one ourselves! 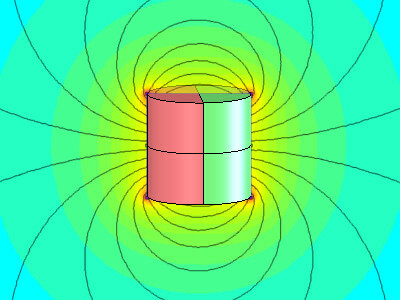 The example shown uses two RC4CDIA, diametrically magnetized ring magnets. We chose ring magnets instead of cylinders because they were easier to mount using off-the-shelf hardware. We put them side-by-side to make it easier to build and see. It’s a great demonstration of how it works. Initially, when building it, we thought we might show all the details so our readers could learn how to do it themselves (and maybe buy some K&J magnets to do it). However, we learned that assembly is a real challenge. We also found that we spent more money on magnets and parts from the hardware store than if we had just bought a Magswitch®. It’s a great magnet-science demo, but you’re probably not going to save money with assemblies like this. It's easier and less expensive to just buy an MJ-95 or MJ-150 and get on with it. The pull force numbers listed on these products are the force required to pull them away from a really big, thick steel surface in ideal conditions. In most cases, you’re not going to see strengths quite that high. Plan on lower numbers. If your material is thin, you’ll see less force. The incredibly powerful MS-400 can hold hundreds of pounds when we stick it to a thick I-beam. It’s not nearly as strong when we stick it to a cheap filing cabinet made of thin steel. The condition of the surface also matters. If it’s painted, the magnet is a tiny bit farther away from the steel, so you get less force. Have a rusty surface? Less force. Maybe your surface has an irregular shape; this might also affect the force. In what direction is a force pulling on the magnet? This also matters a great deal. You’re not going to be able to apply 150 lb of shear or sideways force against an MJ-150 and expect it not to move. This is true of all magnets. Don’t heat up Magswitch® magnets. Like all neodymium magnets, high temperatures can partially demagnetize them. Avoid anything above 176°F (80°C). It’s recommended to only turn on the Magswitch® when you have it up against the thing you’re sticking it to. You won't hurt the Magswitch® by turning it on while loose, but it’s safer not to have that surprisingly strong pull force on while sitting lose. This might prevent someone from pinching his or her fingers unexpectedly. What’s going on inside these magnets to make them work so well? Let’s try and take a look inside to understand what's going on. 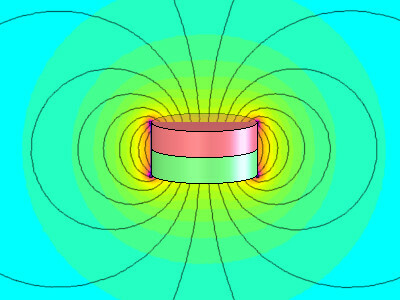 We'll consider the magnetic field around a magnet in a few different situations. We’ll start simple, and work up to how the Magswitch® works. First, consider a disc magnet in free space. It has a magnetic field whose direction “flows” from one pole to the other. In this picture, there’s nothing nearby to attract to. The black lines are often called lines of flux. They indicate the direction of the magnetic field around the magnet, running from the north pole to the south pole. Sometimes we say the magnetic field "flows" from one pole to the other. When we say this, we're really describing the direction along these paths. There's nothing actually flowing there, like electricity flows through a wire or water flows through a pipe. Next, consider the simple case of a disc magnet sticking to a steel surface. The picture is very similar, but the steel alters the direction of the magnetic field a bit. The steel “redirects” the magnetic field. It’s as if the field “likes” flowing through the steel more than air. 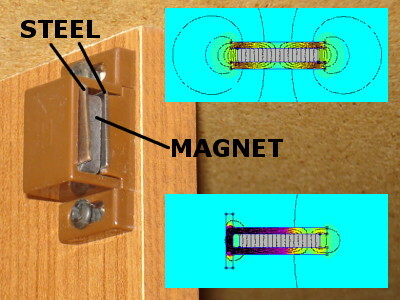 Here, there is a pull force between the magnet and the steel. Let’s consider magnets often found on cabinet closures. Inexpensive cabinet closures often use a cheap ceramic magnet that’s surrounded by two steel plates. 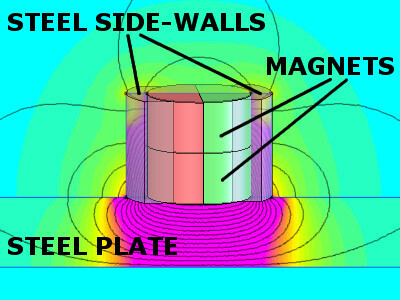 This setup helps address some of the weaknesses of ceramic magnets, such as low strength and a tendency to demagnetize. This configuration can provide a decent pull force to a steel surface. 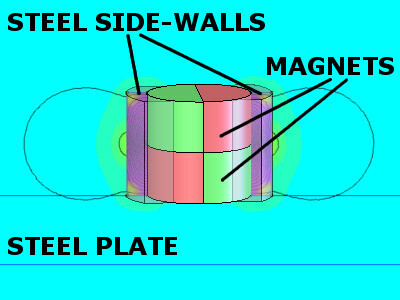 When the steel strike plate isn’t present, the two steel sandwiching pieces look like the north and south pole of a magnet. When the cabinet closes and the steel strike plate comes into contact with the steel side-plates, the magnetic field flows through the strike plate and attraction is felt. The two field pictures show the setup both with and without the steel strike plate of a cabinet door. In the lower right depiction, we might describe the direction of the magnetic field like this: The lines of flux "flow" out of the north pole, turn to run in the plane of the steel side-plate, and then out the side. If the steel strike plate is present, the field flows through it, making a strong attraction force. The direction then flows back out of the strike plate, through the other steel side-plate, and back into the magnet at the south pole. OK, now let’s get back to how the Magswitch® works. Consider the ON position first. In this position, we find that the path of the magnetic field is quite similar to that common cabinet closure. 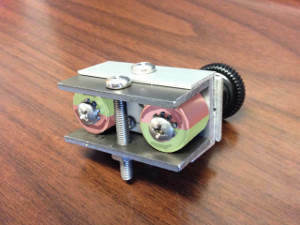 The Magswitch® has two diametrically magnetized disc magnets inside, stacked on one another. In the ON position, the north poles are pointing in the same direction. When positioned like this, we can think of it as a single magnet. The Magswitch® also has some thick steel walls on two sides of the magnet. Schematically, this magnetic circuit looks a lot like that cabinet closure. The magnetic field flows from one pole of the magnet(s), through the steel side-walls, and out through the object you’re sticking to. It then "flows" back into the opposite steel side-wall, and into the other pole of the magnet(s). Now, the cool part about a Magswitch® is that you can turn it OFF. Here’s where the magic happens. When you rotate the knob, you’re rotating the top diametrically magnetized disc magnet by 180°. 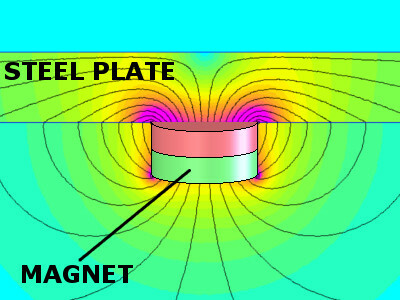 Now the magnetic field flows from one magnet, through the steel wall and into the other magnet. The folks at Magswitch® must have done their math right, because the steel structure is shaped and sized just right to keep all of the magnetic field flowing inside the assembly. It doesn’t reach outside at all! In this position, no pull force is felt. We've tried it ourselves, and these powerful magnets won't even pick up a single paperclip in the OFF position. Note: Those magnetic field depictions aren't from Magswitch®. We made them up here at K&J to help describe what's going on. They may not be perfectly accurate, but we hope they show the general idea well enough to see what's going on inside these incredibly cool magnets. Please accept our apologies for any quick-and-dirty inaccuracies! You can find short videos of these magnets in action on the product pages. Click on the links and hit the "Video" tab on the product page to find them: MJ-95, MJ-150 and MS-400.